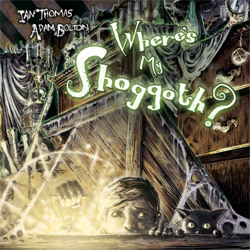 Artist Adam Bolton wonderfully illustrates Lovecraft’s creations as the book’s protagonist searches for his lost pet Shoggoth. What’s a little boy is doing with a train-sized multi-eyed tentacle monster for a pet you ask? Your guess is as good as mine. Taking us through gloomy cemeteries and dark dungeons, Where’s My Shoggoth? introduces us to such notable soul-eaters as Byakhee and the life of every party – Azathoth, the Daemon Sultan. Come this Halloween you have two options: Watch The Nightmare Before Christmas for the twentieth time or introduce your little ones to a new type of horror. If the future is in the hands of our young, shouldn’t they at least have a healthy fear of the elder gods and the mighty Cthulhu? As NASA currently scavenges Mars for signs of life Where’s My Shoggoth? will provide kids with the knowledge that beyond the stars there is something omnipresent waiting to destroy them.